Nathan Hanley has left Ballymena United to join Carrick Rangers. Picture: Press Eye. A whirlwind summer of transfer activity at Ballymena United continued tonight as Nathan Hanley left the club. The left-sided player has been released from the remaining year of his Showgrounds contract after agreeing terms with Carrick Rangers. United boss David Jeffrey said: “We were approached by Carrick regarding Nathan’s availability and after speaking with the player we gave Carrick permission to approach Nathan. 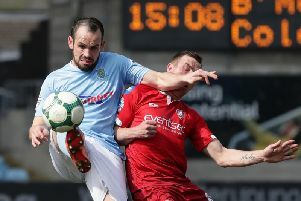 “I was advised by Kieran Harding this evening that Nathan has finalised personal terms with Carrick and so Ballymena United have agreed to release him from the final year of his contract. “I’ve spoken to Nathan and he has thanked everyone at Ballymena for how he was looked after here.